U.S. President Donald Trump barrelled into a NATO summit with claims that a natural gas pipeline deal has left Germany "captive to Russia" as he lobbed fresh complaints about "delinquent" defence spending by allies during the opening of what was expected to be a fraught two-day meeting. U.S. President Donald Trump barrelled into a NATO summit Wednesday with claims that a natural gas pipeline deal has left Germany "totally controlled" and "captive to Russia" as he lobbed fresh complaints about allies' "delinquent" defence spending during the opening of what was expected to be a fraught two-day meeting. 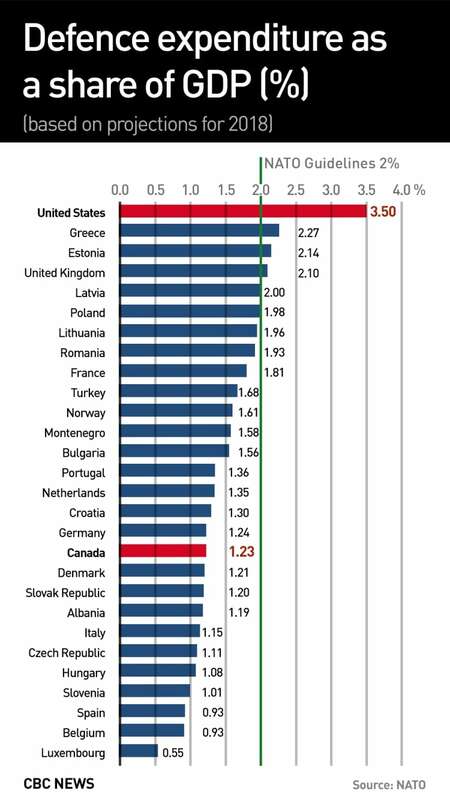 Trump also suggested that NATO allies commit to spending four per cent of their gross domestic product on defence — double the current goal of two per cent by 2024. And with that, he went on to push allies at the summit to double their commitment on defence spending. "During the president's remarks today at the NATO summit, he suggested that countries not only meet their commitment of two per cent of their GDP on defence spending, but that they increase it to four per cent," said White House spokesperson Sarah Sanders. She said the president raised the same issue at NATO last year and that, "Trump wants to see our allies share more of the burden and at a very minimum meet their already stated obligations." 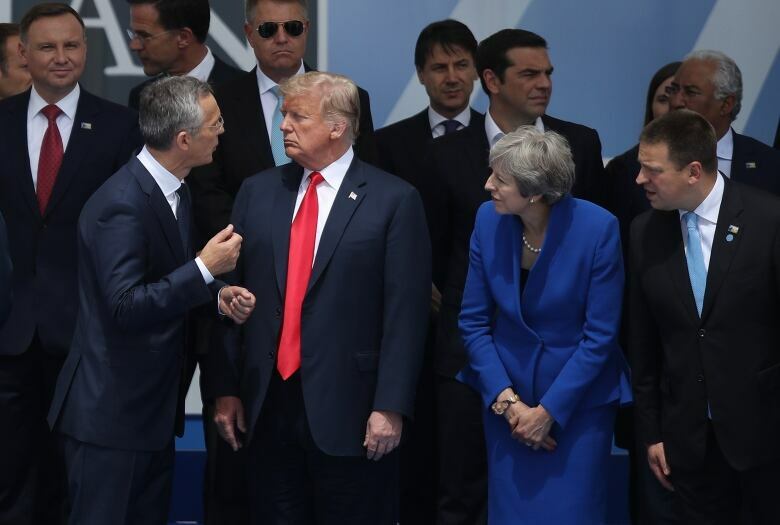 However, a formal summit declaration issued by the NATO leaders Wednesday reaffirmed their "unwavering commitment" to the two per cent pledge set in 2014 and made no reference to any effort to get to four per cent. Trump's pipeline criticism was an unusual line of attack for a president who has proclaimed himself eager to improve relations with Russia's Vladimir Putin and dismissed the U.S. intelligence community's assessment that Russia tried to undermine Western democracy by meddling in the 2016 U.S. presidential election to help Trump win. Trump has long argued that improving relations with Russia would be good for both nations. "His behaviour this morning is another profoundly disturbing signal that the president is more loyal to President Putin than to our NATO allies," they wrote. But Sen. Tom Cotton, a Republican from Arkansas and a strong supporter of the president, said the pipeline issue strikes at the "heart of NATO unity." 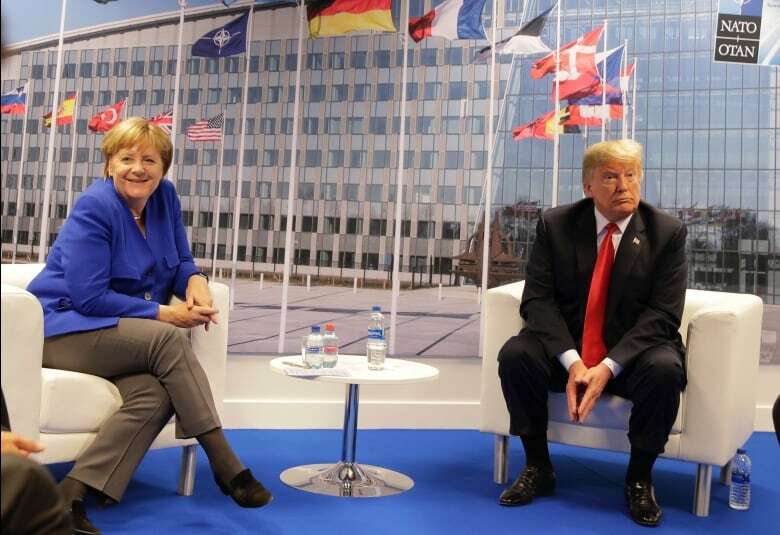 Despite Trump's claims about Germany, Merkel served as a forceful advocate for imposing — and maintaining — sanctions on Russia after it annexed Crimea in 2014, arguing that it violated the principles of the international order established after the Second World War. The president is also not the first leader to point to the impact of Nord Stream 2 on Europe, echoing complaints from Eastern European allies who note it would cut out transit countries such as Poland and Ukraine. Merkel, for her part, called the two nations "good partners" and said "we wish to continue to co-operate in the future." 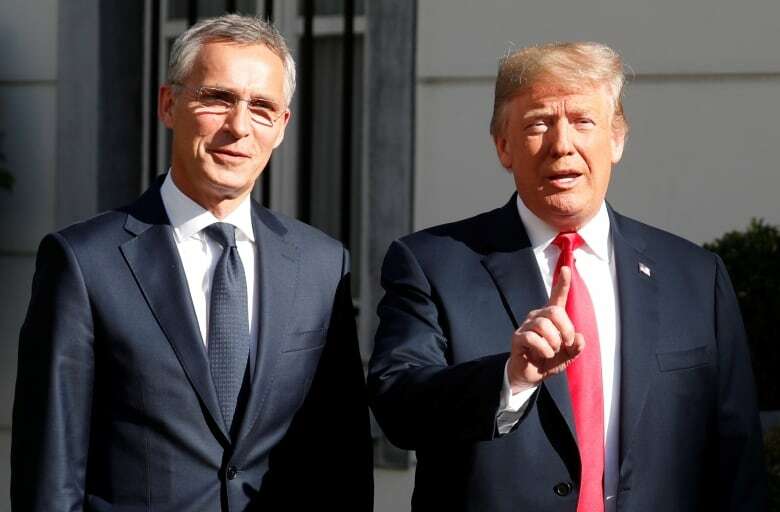 Trump has long pushed NATO members to meet their agreed-to target of two per cent by 2024 and has accused those who don't of freeloading off the U.S.